It’s important to make your outdoor ideas a place that is a memorable one for both your family and guests. To get a my relaxing outdoor living ideas. I had to make the furniture comfy and relaxing. I felt a setting like this would make family and guests feel like they were at a resort. 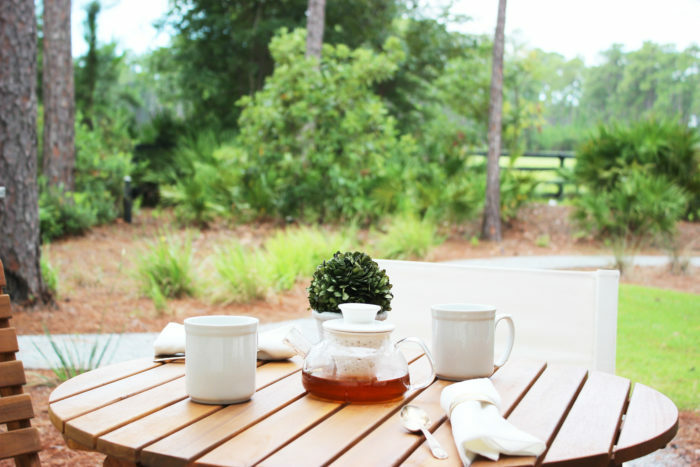 Here is some outdoor patio ideas! The dining set is one of the most important pieces of furniture for outdoor living space. It’s the spot where your family and guests sit and chat, while enjoying their food and cocktails. 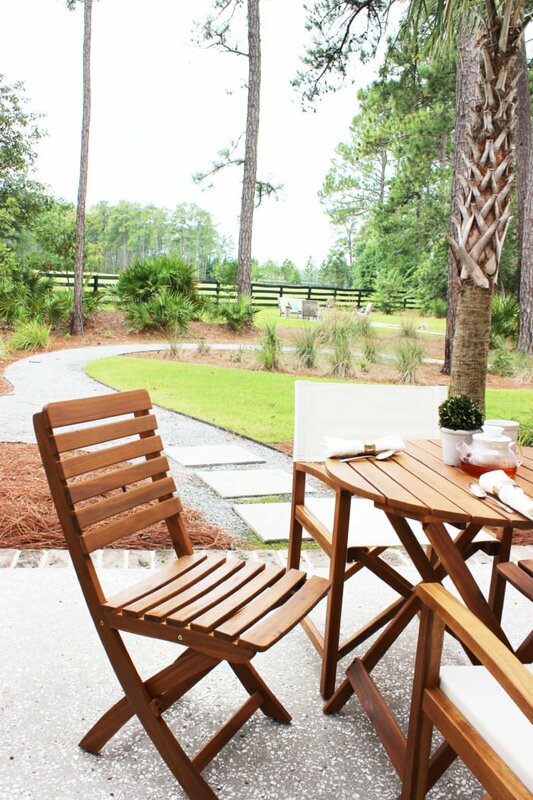 I personally like the look of teak wood in outdoor furniture. 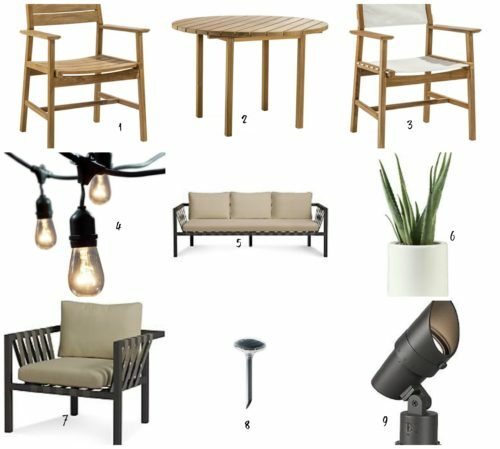 Lumens has some amazing outdoor furniture pieces that will create this look of resort living. 2. 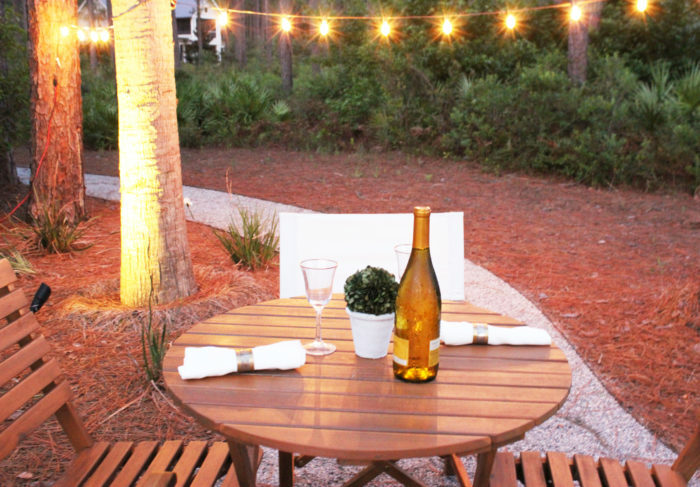 Lighting is so key for creating a beautiful outdoor living space for your guests. Not only that, but it also makes it possible to continue spending time outside with your family and friends even after the sun goes down! I chose to utilize lighting throughout the pathways. This was part of the outdoor design ideas. 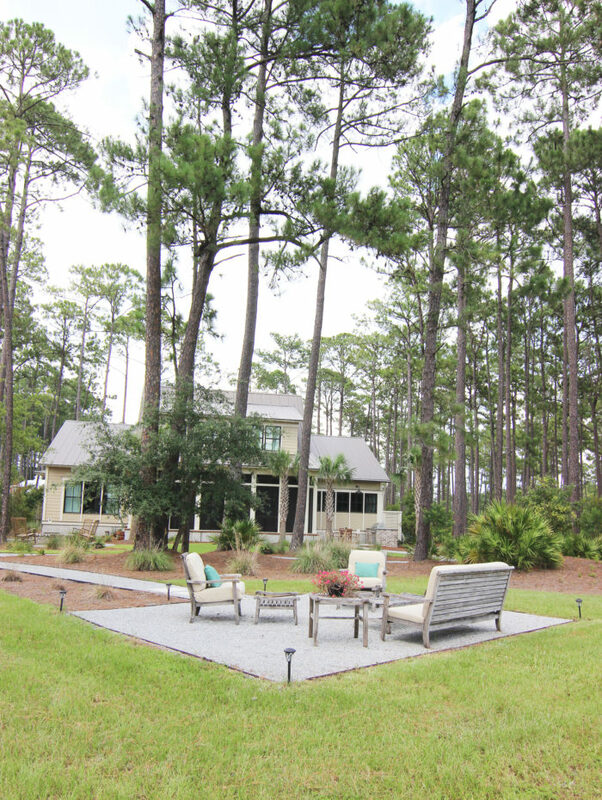 We designed the paths so that they led to our entertaining spaces outdoor. To highlight certain trees and garden areas, we added spot lights. For a simple solution that requires no hard-wiring, solar path-lights are a smart option, and stylish too. 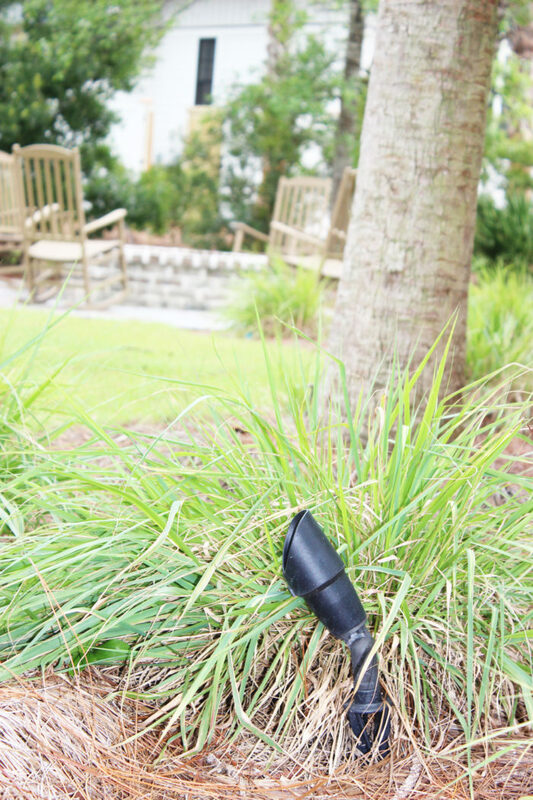 Consider adding them to hard-to-reach areas, where it would normally be costly to add traditional landscape lights. 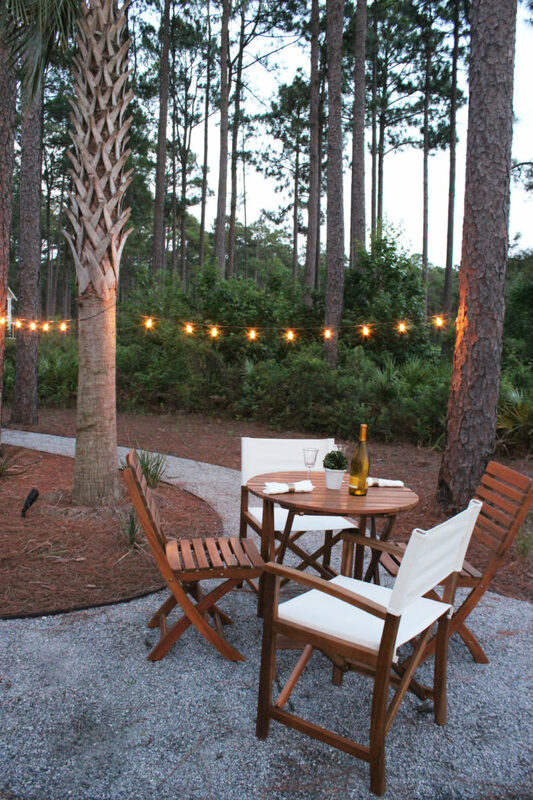 Adding string lighting for night time parties and gatherings. It’s a great way to add to the overall outdoor design ideas. Night time is a relaxing time and I guarantee people won’t want to leave! That teak table and chairs, in the evening, with the lights, and the wine….. I am drooling! You definitely made your outdoor space very “resort-like”! Great job. The furniture you choose is beautiful too! what a serene setting! Love the lighting touches. I love lights and garden spaces, something magical about it. Outside is a place to relax and think about nature, so its a place close to my heart. You are so right. I love to hang out in our backyard and watch the sun set. Thanks for stopping by! I am so glad to hear that you love hanging outside too, its great for the mind! Maria, you’ve created such a welcoming outdoor space! 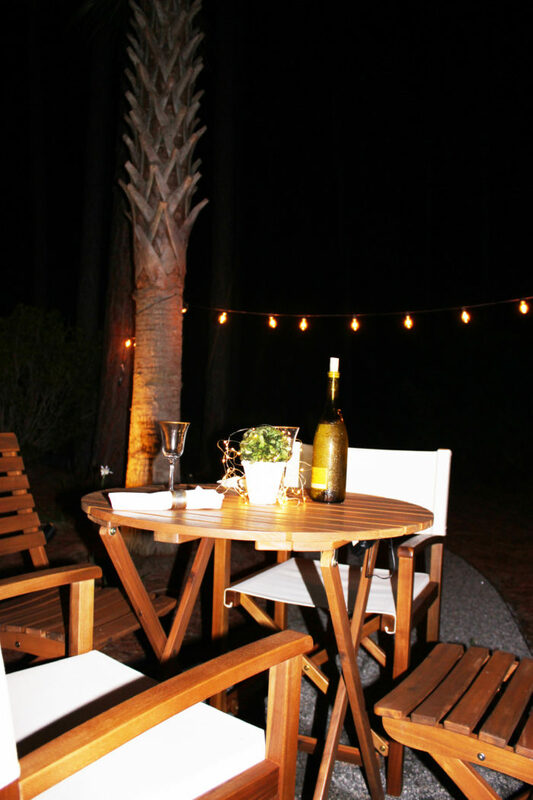 Who wouldn’t want to sit by the fire pit or enjoy next to the fire pit or enjoy a glass of wine under the twinkle evening lights. You nailed the resort ambiance! Lovely Maria! You have such a wonderful yard to experiment with different decor. Love the lumens lighting and table set. Fits great in your yard! I love the table and chairs with the lights. Thanks for sharing. Thanks so much in checking out the outdoor ideas for entertaining, I hope it helped you. I absolutely love the space with the string lights. I would love to relax under the stars there! Meg, I know I love haning out when the stars are out! What beautiful ideas! I love your outdoor space! Emily, thanks so much for the visit, let me know if you have any questons! Love the ambiance you created here. It’s wonderful. Thanks so much! its fun to be in a outdoor space that is peaceful. You house is always so beautiful Maria! I love your outdoor space! What a great place to sit and relax and those lights are the perfect finishing touch! Pinning and sharing! Samantha Glad you like the post on the outdoor spaces, its a place that I love decorating and spending quality time there. Laurie, Hope you are well, thanks for visiting! GLad you like my patio space, its my hidden relaxing place. 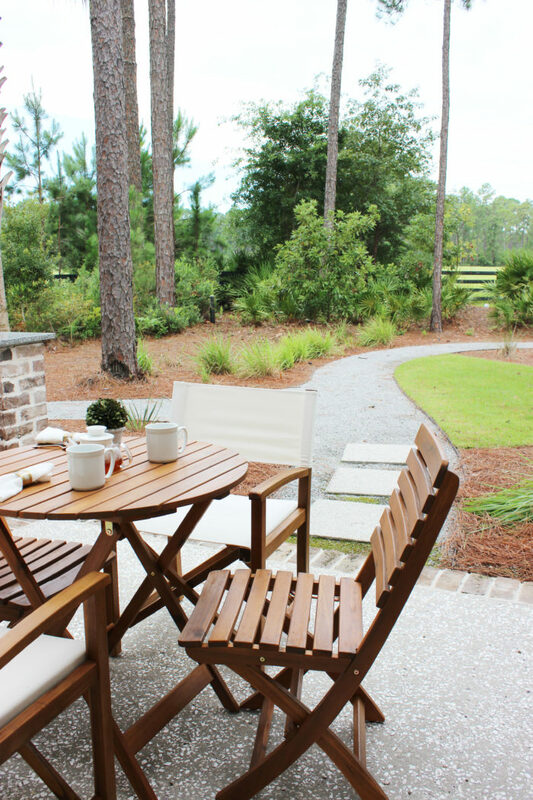 I love a great outdoor space and this one is so simple and elegant! I love decorating with nature so I’m happy to have found your blog, it is such a fun idea. This is gorgeous! I love the view of your backyard. It’s so peaceful. So happy you shared at Dishing it & Digging It link party. We love having you. resort-like is for sure! enjoy! Thank you Maria for joining us at TOHOT and for another beautiful post. 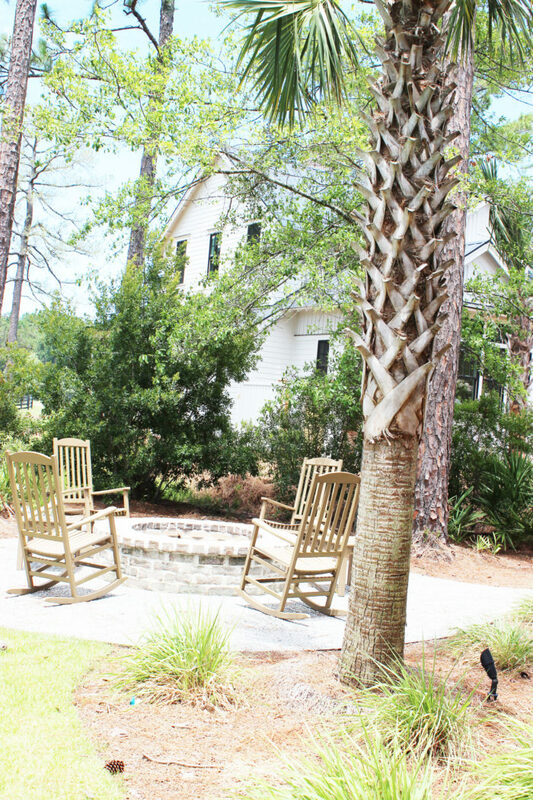 This looks like the perfect place to gather with family and friends!! Love the teak wood look and those string lights give a romantic look. You have put together a wonderful gathering space!! Thank you so much for stopping by, its a great feeling that my post is liked. I am happy you have been inspired! They do have some really nice choices! What a great outdoor space! We just added some outdoor string lights and I love the soft glow it gives. This space is absolutely everything, I love it! Liz, love your parti, its a really good one, I hope you have a great weekend coming up. What an honor to be featured on your party! thanks so much!